Matinée debut from Australian supergroup Bart and Friends! From humble beginnings in the 1990s in Girl of the World to founding member of The Cat’s Miaow (and later Hydroplane, Pencil Tin and The Shapiros), indiepop icon Bart Cummings has spent two decades warming our hearts with his jangly pop nuggets. With a cast of other Australian luminaries, Bart and Friends debuted at the turn of the century with releases on Drive In Records and Bart’s own Library Records. 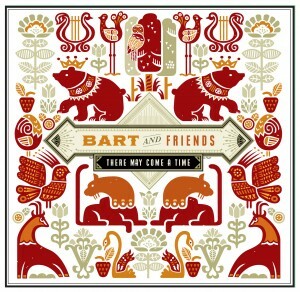 Nearly a decade later, Bart and Friends made a welcome return with a handsomely received EP and mini-album on the hip Lost and Lonesome imprint. Joining Bart in the current superstar lineup are Mark Monnone (The Lucksmiths), Louis Richter (Mid State Orange, The Lucksmiths), and Jeremy Cole (The Zebras), with ace vocal stylings by Pam Berry (The Pines, The Shapiros, Glo Worm, Black Tambourine, etc.) and Scott Stevens (Summer Cats, The Earthmen). The Matinée debut is the ‘There May Come A Time’ EP showcasing Pam’s incomparable vocals across six fantastic songs. The melodious and chiming title track could have easily graced any former Shapiros release, and with it the band has accidentally recorded its first three-minute pop song which is certainly remarkable to any serious student of Bart’s previous bands. Other tracks on the EP include a brilliant cover version of the Elvis Presley classic ‘Can’t Help Falling In Love’ with especially jangling guitars, a swinging pop gem called ‘A Kiss You Won’t Forget’ and the perfectly pithy ‘There Are So Many Things I’d Like To See’ with a bassline that will make every Lucksmiths fan smile. The EP ends with two favorites—‘These Words Are Too Small’ and ‘A Summer’s Dream’—from the sold out first EP for Lost and Lonesome. ‘There May Come A Time’ is a smashing release for Bart and Friends and another classic addition to the Matinée discography. Bart and Friends (Bart Cummings e amici) approda su Matinée Records! L’australiano, dopo il ritorno sulle scene dello scorso anno con Stories With The Endings Changed su Lost and Lonesom, ci propone un EP di genuino indiepop minimalista. Il debutto There May Come a Time segna anche il ritorno di Pam Berry (The Pines, Black Tambourine, Glo Worm…) alla voce attraverso sei fantastiche gemme che rassicurano chiunque con la classe di chi l’indiepop l’ha vissuto – e l’ha modellato – sulla propria pelle. Esclusivamente sotto i tre minuti canonici, si balla facilmente dagli esili jangle della title-track fino alla più swinging A Kiss You Won’t Forget o alla brevissima There Are So Many Things I’d Like to See, da far impallidire i fan dei Lucksmiths. Nell’EP c’è anche spazio per due vecchie canzoni risalenti al primo EP (These Words Are Too Small e A Summer’s Dream) e una cover di Elvis Presley: Can’t Help Falling In Love. Per amanti sognatori, un nuovo tassello dalla fantastica discografia targata Matinée. --Frigopop!